Through an oche on the dart mat or individually, you always have the official distance (237cm) to the dartboard. 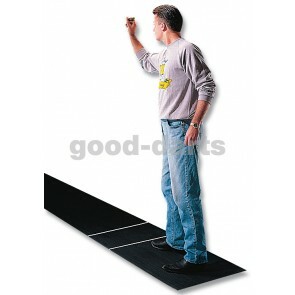 The higher stand and skid resistance on the dart mat gives more safety when dropped. You also offer your floor in front of the dartboard important protection against wear or damage from falling darts . Dart Carpet or Rubber Mat? Which is better? For protection against the dartboard, you can use a rubber dartmat or a dartboard with a non-slip underside. Both variants protect the floor and provide an accurate discharge line according to official figures. Rubber dart mats and dart rugs are non-slip bottom, the dart rug is fixed on most materials such as tiles, wood or parquet. You can achieve even better adhesion with a double-sided adhesive tape, possibly also in conjunction with Velcro. The dart carpet is used more for home use because the dartmat is not exposed to extreme soiling here as in public pubs or clubs. The carpet material can be easily cleaned with the vacuum cleaner and offers a homely look through the textile materials. A rubber dart mat can be very well cleaned and also forgives when you go down a beer. Rubber dart mats offer better slip resistance on the ground and also a slightly firmer footing than a dart carpet. Which breakout lines should be on the dartboard? Since 2015, the distance for Soft and Steel Dart has been adjusted to 237 cm. For this reason, some dart mats still have 2 marks. One for Steel Dart (237 cm) and one for the old Soft Dart Distance (244 cm). The dart mat now only needs one drop mark at 237 cm. Will my floor be spared steel dart bouncers? 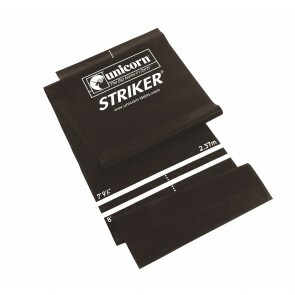 If a steel dart hits the mat directly with the tip, then the dart mat will not provide any protection and is very likely to damage the tile or wood floor. To avoid this, making too much protection under the front of the mat just before the dartboard makes sense. For this we recommend a thin wood chipboard or a floor mat for wood looms. 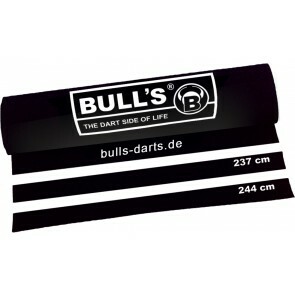 It can be easily cut to fit perfectly under any dart mat and provide added protection. Do you need to attach the dart mat to the floor? The experiences of our customers say that the additional fixation on the floor with a double-sided adhesive strip makes sense. Especially if the dart mat can stay permanently in front of the dartboard. If the dartboard needs to be stowed away after playing, a double velcro (with double-sided adhesive tape) or an extra anti-slip mat (eg from Ikea) makes sense. A fixed fixation at the corners also reduces the risk of tripping and prevents the mat from buckling back and forth. How long should a Dartmatte be? Now that the throw distance for soft and steel dart has been adjusted to 237 cm, only one ejection line is required on the dart mat. Dartmats with Fits: Here you are still standing on the mat behind the break line with both feet. 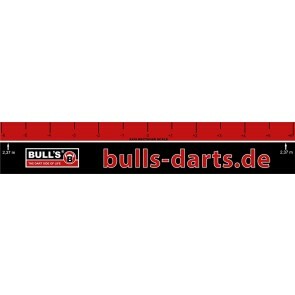 Dartmats without over leash: Here's the bull's-eye line at the end of the dartboard and you stand behind the dartboard when you drop. Please note for dartmats without surprises, there is a slight risk of tripping when taking the first step towards the dartboard after throwing. Which Dartmats are free from odors? Every new carpet and every gum has a certain odor. However, this can vary greatly and so are especially the cheap China products with odor-intensive plasticizers provided, which will only disappear after a long time. 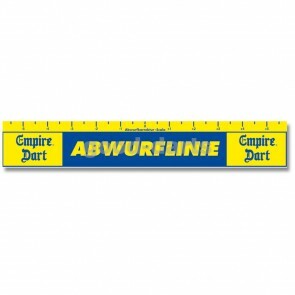 For dart mats we therefore always recommend branded products from renowned manufacturers. 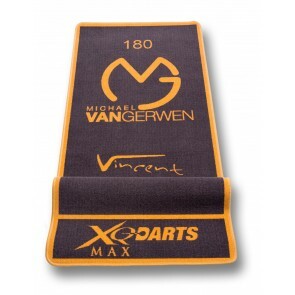 According to our customers, the smell of the following dart mats has disappeared very quickly. How are Dartmats and Carpets cleaned? You can clean a dart carpet dry with a vacuum cleaner. The coarse and fine dirt can be removed so well. For stubborn stains, you can use a traditional carpet foam. Rubber Dartmats may be wet-cleaned with a standard neutral detergent. We recommend drying the mat after cleaning, otherwise water stains on the mat may be left behind. Will a rubber dart mat be ripped? For regular care of the Dartmatte you can use a vegetable oil once a month. Apply this with a cloth very low on the surface of the mat. This will prevent the mat from drying out and maintain the flexibility of the material. Please note that you have to move in 2-3 days.